The ShowerBaby® is also a safer way of bathing babies compared to slippery adult bath tubs or portable bath tubs used in kitchen sinks or on tables and countertops. You never have to worry about an accidental drowning when bathing your child because the water drains into the commode as the baby is washed. The ShowerBaby® always provides a stable, safe place for bathing babies! Parents can now stand and shower their babies at a comfortable working height. No more sore knees or strained backs from giving baths in the large family tub! 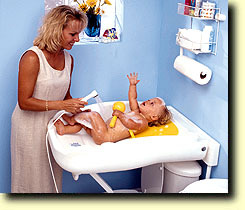 Showering a baby on the ShowerBaby® is a much faster and less messy way of giving baths. Plus, showering your baby really allows you to get them clean, unlike baths where the dirty water stays in the tub. Watch the online video. Read all about how with a help of Showerbaby® Baltimore Orioles' Leadoff Hitter Pitches In at Bath Time.